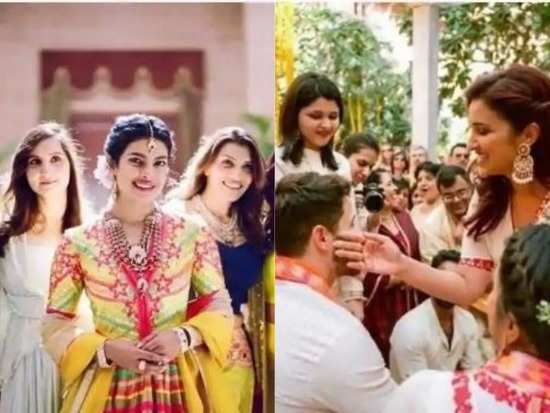 HomeCelebsWhat Nick Jonas gave Priyanka Chopra's bridesmaids in exchange for his joote will leave you stunned! Priyanka Chopra and Nick Jonas took the Internet by storm when the wedding pictures of the couple were released online. In what can be described as a series of beautiful and adorable pictures, the couple was seen tying the knot. And even now as some time has gone by since their wedding, photos of the newlyweds keep surfacing on the Internet and people just can't get enough of them. Priyanka's cousin Parineeti Chopra has also been putting up pictures from her Mimi didi's wedding. And while we're in awe of all of them, the one that really grabbed everyone's attention was the one where Parineeti was applying haldi to Nick's face during the haldi ceremony. Post this, the actress has been asked multiple times about all the ceremonies that took place during the wedding. When the actress appeared on a chat show, she was asked about the joote chupai ceremony which is common in most Indian customs. To this, she said that while the bridesmaids were prepared to extort thousands of dollars from Nick, the groom apparently had come prepared beforehand. At his signal, his groomsmen brought out a tray that had personalised sparkling diamond rings for all the bridesmaids. Needless, to say they were all taken aback. Talking about him, Parineeti said, "He is the best." Well, if our jiju gifted us a personalised diamond ring, we'd think he was the best jiju in the world too! But wasn't this such a sweet gesture from his end? Well, we wish Nick and Priyanka a lifetime of joy and happiness ahead. Stay tuned for more updates. 1What Nick Jonas gave Priyanka Chopra's bridesmaids in exchange for his joote will leave you stunned!